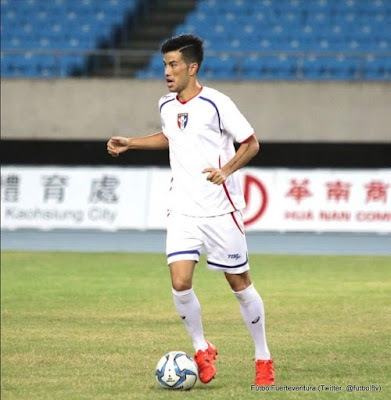 Taiwanese defender Yaki Yen has been on fire since transferring to new club Qingdao Huanghai from Changchun Yatai. Two games into the new Chinese League One season and he has two goals, both of them coming from corners which are to be expected from a defender banging in the goals. During the season opener against Dalian Transcendence, Qingdao got a corner in the 40th minute of the game with Qingdao trailing 2-1, the corner was slung into the box and a goalmouth scramble ensued, the ball bounced to Yaki and he managed to slam it into the back of the net with a mighty toe poke. This goal was crucial as it was close to halftime meaning Qingdao went into halftime with the momentum on their side. Coming out for the second half with the game tied, that momentum carried Qingdao on to the win, as they scored two more goals to win the game 4-2. Next up on match day two, Yaki’s Qingdao travelled to Shanghai for a match against Shanghai Shenxin. This time it took Yaki a whole 3 minutes before he nodded Qingdao in front. Unfortunately, they didn’t manage to hold onto the lead and the game ended 3-3. Taiwan and Yaki will be hopeful he carries on his run as we enter the international fixtures with Taiwan facing off against Singapore on March 27th.